Across our great nation, tucked away in strip malls, dark bars, dingy coffee shops and dilapidated bowling alleys are restaurants and grills serving perfect burgers and fries. One of our many goals as the Burger Guys is to uncover these hidden jewels and inform our growing number of national and international readers. I have spent most of my adult years seeking and cataloging these treasures and will now slowly release these findings in language and terms that the uneducated masses can understand. The Deli is an establishment that most bathed people would never enter. But a few years ago, I spotted a semi-conscious dirty mass stumbling out of the Deli and falling to the pavement at 1AM. I stopped to help, and as I was going through his wallet, he threw-up on my pant leg. Disgusted and angry, I walked into the Deli looking for a bathroom, and was greeted by a delicious cloud of smoke emanating from the grill and fryer. I quickly forgot about my dripping leg, detoured up to the counter and ordered a Deli cheeseburger and fries. As I turned around to find a table, I tripped over "my friend" who had crawled back in on all fours looking for his wallet which I forgot to return. As tears started to well up in his eyes, I explained to him that I took his money because I thought that he would be very hungry after his bout of explodious vomitious and came inside to buy him a burger and fries. He thanked me; we sat down at a table, and our partnership as the Burger Guys was born. The decor for the Deli is late 60's Alabama Frontyard. Posters of boxing, race cars, and Budweiser adorn the walls. The stereo as we entered was blaring "Freebird" while the TV played reruns of NASCAR championship races. The floor was ankle deep in crumbs and dirt, and a Coke can rolled across the floor and settled under a rusted Kenmore washing machine. If a customer wanted his table cleaned, he cleans it himself, and if he wants a Coke, he'll have to go behind the counter and pull it out of the refrigerator. Bernie, the owner and chef, said he didn't want his restaurant reviewed because he doesn't want anymore customers. He has no phone, no set hours and doesn't take reservations. 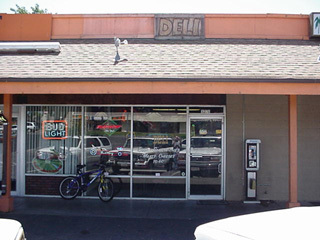 Bernie's Deli serves burgers, the best sandwiches this side of the Sacramento River, and a seventeen pound breakfast burrito that could feed a family of four. The Deli's cheeseburger and fries may be the city's best value at $5.00. The patty is lightly seasoned, 1/3 to 1/2 pounds of fresh, fried beef. It is browned, slightly crusted on the edges yet still very juicy. It is topped with a generous slice of cheddar cheese and presented on an eight inch, toasted, French roll. The condiments are a spread of mayo, unwashed lettuce leaf pieces, thin slices of tomato and several large slices of raw white onion. The fries are made from skin-on, fresh cut potatoes, served mountain high, fire-hot, salted and full of excellent Russet flavor. They are a fry with very few peers, but the Deli has a major consistency problem -- not with quality but with them being cooked. On several visits to the Deli, the fryer was either broken or Bernie failed to buy potatoes for the day. Restaurants like the Deli are excellent alternatives to the institutionalized, fast food found at franchised, burger corporations. Not only is the food usually rich in flavor at these smaller restaurants, but the feeling of home cannot be duplicated by the company suits even if they are sporting a children's toy head. In an effort to give our readers what they want, we decided to shorten these columns a bit. The profoundly verbose and pompous Prof. Beef has a tendency to put people off with his long winded, albeit accurate, reviews of the all American classic. With my senses acutely aware of my surroundings I picked up a tip from a dental office in Orangevale, two ladies discussing the "best burger ever" was across the street on Greenback, so I called my sidekick on his moped phone and we were there. As we approached Bernie's Deli I felt a familiar twinge of excitement. This place was a dive. Dives can be some of the best places on earth to experience down home cuisine, and they can be some of the dirtiest places whose only claim to fame is being featured on Fox's "Caught on Tape". The risk to reward ratio is dubious. My partner on the other hand was noticeably uncomfortable in this NASCAR/Raider/WWF decorated biker bar/deli. Maybe it was his periwinkle silk suit with the tone on tone fuchsia tie and shirt. Anyway he made quite an entrance as he wiped off the seat, in Niles Crane fashion, before he sat at the bar stool. We ordered up a couple of Deli Burgers and a side of fries for $5.00, a can of coke is an extra $1.00. The restaurant seems to be a haven for local construction workers and other blue collar types. They would come in and order a beer and chef Bernie would bark, "get it yourself". Entertainment like this does not happen at Denny's. When our food arrived, we had to get it ourselves, the Burger was huge and the fries were monstrous. The burger is prepared on a toasted sourdough roll, mustard, mayo, a few shreds (shards?) of iceberg, two tomato slices cut with a microtome, and big giant slices of onion sliced with a chainsaw. The patty itself was a full 8 inches long, hand pressed into a rectangle about 1/2 inch thick. It was lightly seasoned, fried, and a slice of mild melted cheddar. The fries were superb. He made them right in front of our eyes: scrub the spud, press it through the wire slicer lengthwise, they fall into a tub of ice cold water, and then throw them into the fryer. They came out a dark golden brown, steaming, and lightly salted. To add catsup to these beauties would be a crime. My only slam against the fries is Bernie himself, he is so inconsistent. If he doesn't feel like going to the store, he won't have fries. In fact I went in to the store on another occasion (I normally don't go without the self esteemed Prof., but his "fussiness" is hard to handle in a place like this. He's okay at the Townhouse but not in a Man's Man place), to review this burger and he was out of meat! It seems the nerds at Intel got wind of this place so they placed orders of 20 burgers for their supper and bought him out for the night.